Before he found fame as a playwright and poet, Will Shakespeare was a schoolmaster.....and not a very successful one. He barely got through each day until one night he saw a woman being assaulted. Except the woman looked rather tall and powerful for a tavern wench. He blunders into the fracas, saving the woman from her attacker only to discover that the woman is, in fact, a man. The disguised fellow is on a secret mission and the fate of the Queen, and England itself, in jeopardy. The spy is Kit Marlowe and he cajoles his new friend into helping him secure the realm. What follows is a jaunt of one haphazard calamity to another, good humour and derring-do of "Shakespearian" proportions! As a keen reader of historical fiction, I sometimes wonder if the genre takes itself too seriously. The books are always serious, deathly plots and treachery abound yet David Blixt's "Her Majesty's Will" is most definitely a shot in the arm. I found myself smiling on every page as Shakespeare and Marlowe became a parody of themselves, akin to a Tudoresque Morecombe and Wise as they inadvertently muddle their way through various escapades and scrapes with death. Blixt has a talent for light hearted prose that is rich in detail, with inventive plotting and vibrant, colourful characters. Blixt is a very talented author who deservedly won the "Editor's Choice" award in the Historical Novel Society's Independent Review for his book "Fortune's Fool" and whilst I haven't read that particular tome, if it is as exciting and well written as "Her Majesty's Will", then I will be buying it shortly. Take a chance and read something that is well researched, historical and - yes - funny. You will not be disappointed. 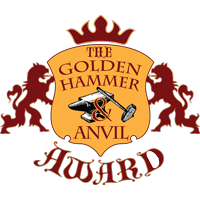 I give "Her Majesty's Will" 5 Crosses and award David Blixt "The Golden Hammer & Anvil Shield" for writing an original novel which will have you laughing out loud. I've become a big fan of David Blixt's novels recently, but this is one I haven't yet read. Based on your review I look forward to doing so.